The EnviroGear G-Series sealed internal gear pump. EnviroGear G Series pumps (formerly known as Maag Industrial) utilize only two moving parts, which the company says operate equally well in both directions while providing a positive, non-pulsating flow. Its design provides multiple inlet and outlet positioning, a single end-clearance adjustment and easy drive-end access for ease of maintenance and adjustability. The G Series pumps are available in both cast iron and stainless steel, which EnviroGear claim are extremely reliable, durable and cost effective for challenging industrial applications involving both thin and highly viscous liquids up to 431,000 cSt. Interchangeable with 95% of the internal gear pumps on the market, EnviroGear G Series pumps allow easy equipment upgrades with no piping changes, no driver changes, no coupling changes, no flow rate changes and no baseplate changes. 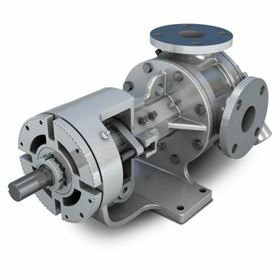 EnviroGear will continue to offer its E Series line of seal-less internal gear pumps.